Cats make great pets but you can't take them out to play in the snow. If you do, they will give you the same look a 14-year-old girl gives her father when he asks if she would like to go to the Build A Bear store at the mall. Dogs, on the other hand, love the white stuff. A yard full of fluffy snow is as exciting to them as a 1970's coffee table piled high with cocaine in the VIP room at Studio 64 was to Natalie Cole. 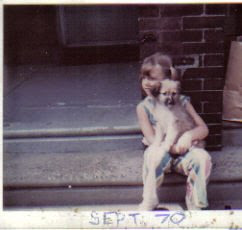 On snowy days like today, I miss my childhood dog, Kelly. We were forced to put her to sleep 25 years ago when we realized her bulging midsection was not a result of too much table scraps but rather distended from cancer and internal bleeding. No wonder she was cranky when I tried to put on her Halloween outfit. Having school cancelled and then getting to play outside with my beloved pet was one of the great pleasures of my youth. Watching her bite the snow made me laugh every single time. Her black nose encrusted with ice crystals was, and still is, the cutest thing I have ever seen. Afterwards, we'd dry off and then curl up together for a snow day nap. Our mutual love of sleep made our bond even stronger. If she were alive today, she would be 38 years old... which is why I'm glad she's not alive today. But I sure am grateful she was alive back then.